Very few people know this, but there is an art to opening Christmas gifts. People display different techniques for peeling off layers of paper and ribbon and revealing the buried treasure inside. (A)	There is one adult female in every family who sits and looks at a wrapped present and says, “It’s so pretty, I hate to open it.” Her lack of perspective concerning what is important (the present inside the wrapping) and what is not important (the wrapping) and her hesitance to get on with it make everyone else want to pick her up and shake her like a rattle. When she is finally persuaded to disturb the wrapping, and find out what she is getting, she VERY slowly and VERY carefully, with great reverence, frees the gift of, first, the ribbon, then the paper. This gives her time to form a plan of how she is going to react if the present inside is something she must hide in a closet or re-gift to someone she hates. (B)	I don’t know about the rest of you, but I have never seen a man act like (A) above. Men usually prefer to rip the damned paper open as fast as possible to see if, this year, they lucked out and are getting something good for a change. There is still a certain art involved. A man can either rip open a gift with great élan or with great disinterest, knowing he is probably getting cologne, aftershave or a tie for the fourteenth year in a row. (C)	Women who are more impatient than (A) above – in other words, the rest of us – usually take reasonable precautions not to tear the wrapping too much while trying to get at whatever is inside. We were brainwashed by our mothers to save used Christmas wrap from one year to another, and we still have Mom’s voice deep in our psyches. That is the Voice of Christmas Past, and it never goes away. (D)	Some gifts, such as a new Harley, are too big to be wrapped. In that case, nobody has to open anything. They just have to figure out how to get the thing out of the living room. This takes half the fun out of getting a present, but it saves paper. (E)	Many families have a joker who loves to put a small sized gift into a large box with a lot of stuffing to take up the extra space. I used to be one of those jokers, until I grew up. This provides endless fun to everyone except the recipient when the gift is opened. If an adult pulls this trick on another adult, the present had better be something spectacular, if the gift giver knows what’s good for him. (F)	Kids are not concerned about such mundane things as wrapping paper. If they are left to their own devices, they will have pieces of mutilated gift wrapping all over the living room floor by the time they get through opening their presents. Mom is usually watching, though, and making sure that enough re-usable paper survives the yearly paper holocaust, to be used again the following year. 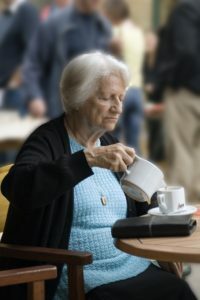 She learned this from HER Mom, who learned it from HER Mom, who learned it from HER Mom, who survived the Great Depression. Giving gifts to our loved ones and beautiful Christmas memories to our children are wonderful things. I wrap gifts in specially commissioned “Die Bon Jovi Die” paper. On occasion. I wrap a present for myself, just so I can read the words. Each to his own and all that. 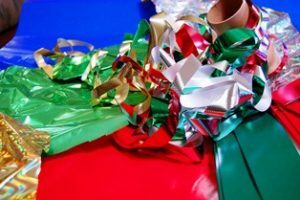 I just came from a 70th birthday party, where the birthday girl said,” my mother would make me save this wrapping paper!” And I have to admit, I was feeling all kinds of environmental angst when they threw it away….oh mothers! It was a family tradition, handed down from mother to children for as many generations as gift wrapping has existed. BTW, my mother was one of those it’s-so-pretty-I-hate-to-open-it women. I never really understood that. I was willing to try to preserve the wrapping paper, but that was the extent of my interest in the outer covering of what I hoped was a good present. 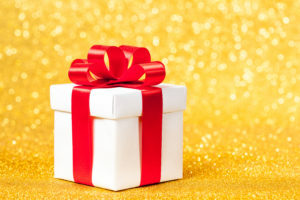 Men get the blue ribbin’ when it comes to indifference to how a gift is wrapped! LOL! At first I thought you were giving men a bum wrap, but then I realized we probably deserve the ribbin’ you gave us here.